The soon-to-be-built 330,000-square-foot Midtown Plaza will be located at the corner of Cardinal at North Hills and Church at North Hills streets, near the Midtown Park and numerous restaurants and retailers. 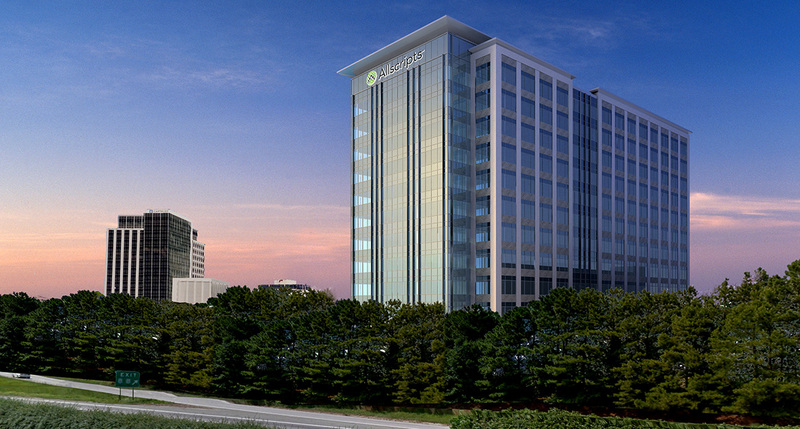 Under the lease agreement, Allscripts will consolidate all of its Raleigh operations to approximately 250,000 square feet in the new building, which is scheduled to open in the spring of 2017. According to the Triangle Business Journal, Allscripts will be relocating from The Forum office park in north Raleigh where it occupies about 305,000 square feet. By the time it moves in, the healthcare information technology company, which employs more than 1,000 people in the city, will also have signage on the top floor of the tower with visibility from the I-440 Beltline. “We will relocate all of the Raleigh operations into one modern and energy-efficient building in Midtown, which many of us know as North Hills. Midtown Raleigh is one of the most desirable locations to work in the area,” David Campbell, senior vice president of human resources at Allscripts, said in a news release. The new Midtown Plaza building is the second office high-rise Kane Realty has started developing at North Hills in the past year. The company is also constructing the 18-story North Hills Tower Two, which is scheduled for completion in the spring of 2016. North Hills is a 130-acre mixed-use multi-generational district located at the heart of Midtown Raleigh. It is also home to the Offices at North Hills (which opened in 2005) and the 17-story CAPTRUST Tower (which opened in 2010).